It is a fact that some people are actually attaching their Christmass tree upside down, with the base on the ceiling and the top in the middle of the room like an evergreen stalactite. It is novel, in that it saves space and leaves more room for the presents. But there are serious drawbacks; how do you water it? The idea of an upside-down Christmass tree provokes a more serious point about Christmass itself. It is summed up in Mary’s song of subversion which we call the Magnificat. This is a revolutionary song about God’s upside-down values, which Mary sang when the Angel told her she was going to give birth to the Saviour: the song speaks of seemingly insignificant people being exalted; the mighty being thrown down; the hungry poor being filled and the rich being sent away empty. the glory of St Paul’s Cathedral in London was contrasted with the clamour of a Protesters’ camp and made me think of a King born in a stable and a ‘Nobody’ becoming Mother of God made man/ Last year that camp made people talk about issues of justice, financial inequality and the future of capitalism in a way the church and politicians in the 21st century have failed to do. We celebrate Christmass in our beautifully redecorated church. May it inspire us to respond generously to those who have little; the Carol Singing collections for Crisis and Shelter; the Carol Service collection for Save the Children; the Crib appeal for Christian Aid. We celebrate the glory of our wonderful mediaeval church but we must celebrate an upside-down Christmass, for we live in a broken, divided world which Christ was born to save. You and I are His hands and feet today and we must get on with the task. I wish you all a joyful upside-down Christmass. St Nicholas was always looking for ways to help the poor. He learned that a poor man whose wife had died had 3 daughters who were old enough to marry, but could not because they had no dowry. (In those days a young woman needed a dowry –some money to set up a household in order to marry.) The poor man could not support his daughters any more and he was just sick with worry about it. One night as St Nicholas passed by the house, he tossed a bag filled with money through an open window of the man’s house and ran away. The poor man thought it was a miracle and his daughters were able to marry. It was much later that they learnt it was St Nicholas who had made the gift. May we follow the example of St Nicholas and learn how we can give and help the poor – so come carol singing for the homeless, and give generously to Save the Children and Christian Aid this Christmasstide. The display of the Holy Family decorated with greenery at the entrance to the house was called a Holy Bough and any person visiting the house during the Christmass period was embraced as they crossed the threshold. We are used to circular wreaths on doors, but if you buy or make one, try to place a card depicting the Nativity in the centre and bring it to church to be blessed on either of the 2 Sundays before Christmass. In the Lady Chapel is a window which was unveiled by Sir Courtenay Warner Bart, MP, Lord Lieutenant of Suffolk, and dedicated at a special service on 22nd January 1922, together with the tablet containing their names, as a memorial to the 24 Mendlesham men who had given their lives in the First World War. The window depicts several people who died for what they believed to be right, or who lived their lives for others. At the top is St Edmund, King of East Anglia (855 – 870). He refused to give in to the Danes and renounce his faith, so he was tied to a tree and shot to death with arrows. Then there is St Leonard, Patron saint of prisoners. It was a mediaeval custom for those who were released from prison to hang up their fetters in churches and chapels dedicated to him. St Leonard visited those in prison and freed captives from slavery. He tried to get criminals to see the enormity of their sins and to change their lives, but also to see they had paid the price of their sin and were not outcasts. On the right of St Leonard is St John, Apostle and Evangelist. He holds a cup that is poisoned. The high priest of Diana at Ephesus gave him a poisoned drink; he hated John because of the power of the Gospel to change lives. However, St John blessed the chalice in the name of Jesus and was unharmed. Underneath is St George, Patron of England. He died in Palestine in AD 303. He suffered like many people do at the hands of evildoers in this world. Many people become the innocent victims of violent people and their fanatical ideas. St George died at the hands of the fanatical emperor Diocletian because he, like St Edmund after him, would not renounce his faith. Opposite St George is St Michael, the Archangel. In the book of Revelation he fights and wins a battle against the Devil. In the centre of the window is the greatest martyrdom and sacrifice of all – Jesus, God made man – dying on the Cross for the sins of the world. Underneath is a soldier dying and giving his life for justice and peace. There is a dove at the top of the window – a symbol of peace and a sign of God’s Spirit. It was this Spirit that changed the lives of St Leonard, St George and St Edmund and enabled St Michael to combat evil and St John to exhort us to love one another. For a new Heaven and a new Earth for which these saints, martyrs and soldiers yearned, we must pray for peace. The last Sunday in October is the Dedication Festival of our church –the day we give thanks for our church building, and this year for the renovation and redecorating of its interior. The answer to that is that we spend money for the glory of God and what we give to Him must never be called “waste”. I have always found that people who give freely for the things of God are equally generous in their giving to Christian Aid and other similar charities for the poor. I remember someone saying that my church should never be locked at night because there ought not to be anything in it worth stealing. I was not very popular when I suggested he surely wouldn’t need to lock his own house because he had presumably sold all his valuables and given them to the poor! May our Parish Church, which has been passed to us by generations gone by, be preserved for generations to come because we have given generously and done our best to preserve it. the 9.30 Parish Mass and the PCC has also decided this will be our special “Back to Church” Sunday for anybody who has stopped coming to church but would like to return and is unsure how to start, or for anybody who has never been and doesn’t know what to expect, who would like to come, but who may be reticent to enter a building which may seem strange. Let me say, first of all, that you are all most welcome. him ministering to those viewed as outcasts of society and sinners. Good clothing, blankets and toiletries will be blessed for the homeless at Parish Mass on 16th September and fruit & vegetables, tinned & packets of food both at the Mendlesham School Harvest Service on 21st September and Parish Mass on Sunday 23rd September. May we all listen to the needs of the homeless and act generously. August is the month of our PATRONAL FESTIVAL at St Mary’s. This is the day when we celebrate the Saint to whom the church is dedicated – in our case, St Mary. Although it is observed on 15th August we are extending it to the end of the week. Our church building celebrates the feast of the Assumption of Mary into Heaven in the flint work in the South porch, with the letters AMR and a crown. This stands for Ave Maria Regina – i.e. Hail Mary, Queen. What do we mean by the Assumption? The Assumption means Mary is already in Heaven with Christ. Already, at the moment of her death, she was worthy to enter the immediate presence of God, and after being most highly favoured on earth she was at once the most highly favoured in Heaven. ‘Heaven with transcendent joys her entrance graced. The Book of Revelation says: ‘Now a great sign appeared in Heaven: a woman, adorned with the sun, standing on the moon, and with twelve stars on her head for a crown.’ (Rev 12 v 1.) We believe that Mary will, in due course, welcome us to Heaven to be with her Son for eternity, but none of this would be possible if Christ had not risen from the dead on the first Easter day. How are we going to celebrate the Assumption? There will be a said Mass on the eve and Mary’s statue will be crowned, then there are two said Masses on the day. On Friday 17th Aug we shall have a visitors’ night celebrating the 5th birthday of our ward of the Society of Mary with a Sung Mass at 7.30 pm. The Principal celebrant and preacher will be the Rt Revd Norman Banks, Bishop of Richborough, who will also bless this year’s special Mendlesham Ale. There will be a wonderful firework display at the S side of the churchyard and refreshments in church. I do hope you will join in our celebrations. I fail to see why some feel the church should not celebrate our Patronal festival with such rejoicing, when they accept fireworks on 5th November commemorating a terrorist who could have blown up the Houses of Parliament and changed the course of history! Our fireworks are generously donated, but we will, of course, be grateful of donations towards the church restoration fund. On Saturday 18th Aug there will be a stunning brass concert at 7.30 pm by the talented Seckford Ensemble and on Sunday 19th after the Parish Mass in the morning, the Brandeston Pickles will be welcomed back to entertain us to an afternoon of Jazz in the churchyard – an event for all the family. In St Mary’s Church, to the right of the high altar, is the window of Christ, the Good Shepherd. 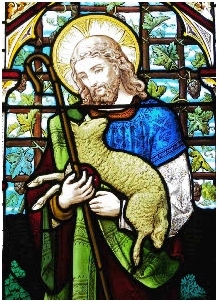 The image of Jesus as a shepherd carrying a lamb on His shoulders tended, in the past, to portray the laity (those who are not ordained) as sheep who listened, obeyed and followed the leadership of the clergy. In former times laity were ‘serviced’ by the clergy rather than having service esponsibilities of their own. Today the focus has moved to laity owning their faith and building the Kingdom of God in partnership with their priests. The laity, rather than acting like sheep, are assuming a more pro-active role in the life of the Church. Baptism needs to be taken more seriously as a commission for ministry, be it in the life of the church, village, community, place of work, recreation or in one’s family. The image of the Good Shepherd is still valid in that it energises us to follow Christ’s example and fulfil our call to service. It is so easy to assume people aren’t interested and won’t come if you ask. but he was smart; he stuck with you. Eddie was willing to‘stick with God’ even though people laughed at him. We are called to do the same and take our vocation as baptised Christians more seriously. St Mary’s is open to all. Please do come. These four elements are regarded as being the four marks of the Church. 1) BREAKING OF BREAD (the Biblical word for Mass/Eucharist). Our main Sunday service is the Parish Mass and we have a daily celebration. 2) We do aim to adhere to the TEACHING OF THE APOSTLES. We have at least 2 extracts of Holy Scripture at Mass each day and sermons are given each Saturday & Sunday as well as some weekday celebrations. There are also study groups, so there is ample opportunity to know and learn more Scripture. 4) FELLOWSHIP – There are many opportunities for this, such as pilgrimages, parish outings, Friends of St Mary’s events, coffee after Mass, shared parties, lunches, suppers and instructions groups and everyone is welcome to join in. 1. ‘Do I ‘break bread’ (i.e. attend Mass) as regularly as I could? 2. ‘Do I study the ‘Apostles’ Teaching’ by reading the Bible regularly? 3. Do I pray regularly? Could I attend Morning or Evening Prayer? 4. Am I fully involved in the fellowship of the church? Do I do all I can to make other people feel welcome? • Those who roll up their sleeves and make things happen. The apostles belonged to the third group and nothing could stop them, not even the threat of punishment. May is Mary's Month; why is Mary important? 1. She says ‘YES’ to God. Before anyone else ever hears the name of Jesus or knows anything about Him, Mary demonstrates the most extraordinary courage in choosing to serve Him. She is the first Christian disciple. 3. Mary is the CHRIST BEARER, which involves far more than giving birth. Mary is the one who first smiles at Jesus, feeds Him when He is hungry and comforts Him when He dies. The Gospels suggest she is with Him at times in His ministry as well. 4. After Jesus’ Ascension, Mary is part of the company of disciples ‘constantly devoting themselves to prayer’ (Acts 1 v 14) awaiting the outpouring of the Holy Spirit at Pentecost. 5. The first and most perfect disciple must be the first amongst those for whom Jesus had prayed: ‘Father, I desire that those you have given to me may be with me where I am, to see my glory…’ (John 17 v 24). If you would like to find out more about Christian Aid week, visit www.caweek.org to read how your gift can make a difference. £4.17 could pay for a bushel of rice or ground nut seeds for a community such as Gbap (in Sierra Leone) to plant and harvest. £32.50 could provide 5 tool sets, each made up of a large and small hoe and a large and small farming knife, for a production group to farm a large area. £180 could provide a cassava-grating machine for a community, allowing them to process the cassava they grow so that if can be sold for a higher price at market. Christian Aid week’s theme is ‘Let’s give the tools to help people in poverty out of poverty’. Please give generously in the Christian Aid envelope that will be delivered through your door and collected later by a volunteer. We shall have a special preacher from Christian Aid on 13th May at our Parish Mass. The re-plastering has been far more extensive than we could have envisaged and our estimate has increased by £800. We proceed in faith, but it is imperative we continue fund-raising for our beautiful church. The ‘Friends of St Mary’s’ continues its work. Mrs Marjorie Rousseau is the new chairman; we thank Ken Abbott for his chairmanship for the past year and are glad he still serves on the committee. Although the scaffolding will probably still be in the church on Street Fayre day, we will do our best to welcome visitors. The Friends will also have a stall selling preserves and collectables. We look forward to a Talk on ‘Celebrating Queen Victoria’s Diamond Jubilee in the Empire, England and Mendlesham’ by Clive Payne on 25th May, a Talk on Antiques on 8th June by James Grinter (of ‘Flog-it’ fame) with individual valuations at £2 per item. Holy Week and Easter is the most important time of the year for Christians. Here is why, here’s what happened and here is how you can join in…. What happened? This is when Jesus entered the holy city of Jerusalem riding on a donkey and was greeted by crowds waving palm branches. Why is it important? It reminds us that Jesus is not some remote, frightening figure, but a real, humble, fragile person like us. How can we join in? Come to church on Sunday 1st April at 9.30. Take part in a dramatised reading of the events of Holy Week and re-enact Jesus’ entry into Jerusalem in a procession from the churchyard into church. Our palm crosses, which we take home to keep, remind us of the palms people threw in Jesus’ path. What happened? Jesus had His last supper with His disciples, when He washed their feet, asked them to receive His Holy Communion and commanded them to love one another. After that, he went and prayed in Gethsemane until his arrest. Why is it important? Through receiving Jesus’ Body and Blood in Holy Communion, we can join with Jesus in His death and in His new risen life. By witnessing the washing of feet we are reminded that we are to love and serve one another. How can we join in? Come to Mass of the Last Supper at 7.30pm on 5th April, witness the priest washing the feet of 12 people and then feel free to pray or simply sit in the beauty and silence of the specially created ‘Garden of Gethsemane’ in the presence of Our Lord at any time up to Midnight. What happened? After His arrest by those who wanted Him dead for religious or political reasons, Jesus was put to death on the cross. Why is it important? Jesus died showing that God is involved in all our lives – the good and the bad – and to carry all the sin and death of the world on His shoulders to prove that His love has stronger, greater power. Although His death seems like a terrible defeat, in fact something extraordinary was about to happen. How can we join in? Come to the special, reflective service at 2.00pm on 6th April in the church unadorned with colour and flowers; take part in the dramatised reading of the events of Good Friday and the quiet procession to the cross and offer your life, with all its joys and sorrows, to God, whose love for us was so great that He gave his life for each one of us. What happened? On the third day after Jesus’ dead body was sealed in its tomb, His disciples met the Risen Jesus and realised that what He had said was true: He is Risen! Why is it important?Jesus’ Resurrection proves that life has a meaning and that death is not the end of life. Now He has defeated death, and life has triumphed over it, that same resurrected life is possible for all, and such a life has no end. Why is it important? Easter is such an important day that we celebrate it twice! Come at 7.30pm on Holy Saturday – 7th April – and gather in the north churchyard near the porch in the near dark; see the new fire lit to symbolise the Resurrection – that light has overcome darkness forever. Flames from this fire light the Easter (Paschal) candle. Receive a candle lit from this candle and join the procession into the darkened church. Hear the story of God’s never-ending love for His creation, His ultimate loving sacrifice and His triumphal Resurrection as the wonderful Vigil unfolds with light, colour, sound and scent. Join afterwards in a party of celebration! You are all welcome, however frequently or rarely you have come to church before. On Easter Sunday (8th April) come and join our family Parish Mass, where all children will receive a chocolate egg – symbol of the new life which Jesus brings. This Lent, may we pray to be messengers of God, by words and actions, to all we meet, just as Gabriel was to Mary. May we have the courage to accept God’s will in all things, as Mary did. May our faith be strong enough to accept the unexpected as Mary unselfishly did and to esteem God’s will above our own personal desires. I trust the Holy Cross Chapel will be available for candles burning each day in memory of departed loved ones during the Easter season (8th April – 27th May). These cost £9 (as 3 candles will be needed to cover the whole period). Please contact Tina Pipe and gift aid your contribution if you pay tax. What is it going to cost? We received 4 estimates for repairing the plaster and redecorating the nave, armoury stairs and aisles varying from £47,680 to £60,538, including VAT (at 20%) and the architect’s fees. The PCC has accepted the lowest estimate from Lodge & Sons Ltd, subject to contract. In addition the Church Commissioners have confirmed they will pay for all the repairs and decorations to the chancel, for which they are responsible (amounting to an extra £7,094). Why is the work so expensive? St Mary’s is a grade 1 listed building of national importance. The walls are 800 years old and need specialist care. Our architect is also an architect of the cathedral at Bury St Edmunds, and specialises in church conservation. It would be totally unsuitable to use ordinary decorating materials and we are unable to use any which are not authorised by English Heritage. Limewash, for instance, has to be mixed to a strict and unique specification according to the needs of each building. Scaffolding hire is also extremely expensive, but is mandatory. The cost includes insurance, in case of any mishap, which is another reason we cannot use volunteer labour. What funds have we in hand? Between the PCC Fabric Fund and the Friends of St Mary’s we have approximately £43,000, so we do need to raise at least another £4,000. When will work begin? By the time this magazine is in your homes, the work should have commenced. Ash Wednesday is the first day of the forty days of Lent – the period in the year that both recalls the 40 days Christ spent being tempted in the wilderness at the start of His ministry and which serves as a preparation for Easter. Last year’s Palm Crosses are burnt and at the Ash Wednesday Mass the priest dips his thumb into these ashes, which are moistened to a paste with holy water, and makes the sign of the Cross with them on the forehead of each person, saying, ‘Turn away from sin and believe in the Gospel.’ Lent actually spans 46 days, but the six Sundays are, as always, commemorations of Christ’s Resurrection, so are not days of self-denial and fasting. This month we have two very important days to observe: Candlemass & Ash Wednesday, which heralds the start of Lent. For a number of years we have been supporting the Additional Curates’ Society, which is currently supporting 105 men considering offering themselves for ordination. That is not to say that they will all be ordained, because the process is slow and difficult and the standards set are high. Between 2010 and 2015 the C of E predicts that over 700 paid clergy will retire and that the number of candidates entering the priesthood will be insufficient to replace those retiring. This Lent we need to pray for more vocations to the priesthood, which begins with God calling and not ourselves. The Additional Curates’ Society is doing a grand work with Vocation Conferences, but all this needs resourcing, which is where our Lent boxes come in. A sacrifice of some luxury in Lent could help fill a box that will be dedicated in the Mass of the Last Supper on Maundy Thursday (4th April). Almighty God, give us priests! When I was at theological college we took turns at reading the Scriptures in our chapel and ordinarily it was a fairly easy task, but when one of the biblical genealogies (family trees) turned up there was a panic, particularly amongst those who stuttered! One such genealogy of Jesus (Matthew 1: 1-25) is featured on Christmass Eve and a weekday in Advent. What is the value of this passage? Christ cannot exclude from His kingdom sinners, or those whom the religious authorities deemed unorthodox. Jesus is Son of David and also Son of Sinners. So as we celebrate the birth of Jesus, let us remember He came for all of us sinners, to save us and set us free. God needs our co-operation and can use the unexpected to triumph over human obstacles. Sin and unorthodoxy does not have the last word, as can be seen from the family tree in St Matthew’s Gospel. Christ needs to be born in the world today and he calls us to be His hands and His feet. The Feast of Epiphany is commemorated on Sunday (8th Jan) rather than 6th Jan this year. Epiphany celebrates the arrival of the Wise Men to the ‘House’ (Matthew 2: 1-12), which is why the representation of the stable in our crib is changed to that of a house. The Wise Men were the first Gentiles (non-Jews) to believe in Jesus. The Bible says: ‘Some wise men came from Jerusalem from the East.’ It does not record there were three – we assume there were three because they gave three gifts. The idea that they were kings first appears in Christian tradition through Tertullian (AD 160 – 220) who calls them ‘almost kings’. The names C(G)aspar, Melchior & Balthasar are first mentioned in the 6th Century. Another explanation of the initials CMB are that they are the first letters of the Latin blessing Christus mansionem benedicat – ‘May God bless this house’. The Plough will also be blessed at Mass – a mediaeval custom to ask God’s blessing on the land at the beginning of the year, and we again welcome the East Suffolk Morris men to dance in the Mass and in procession with the plough through Front Street and Old Market Street after Mass. Everyone is invited to the festivities, concluding with a buffet lunch at St Joseph’s Centre.